The Nickajack Elementary Foundation is a nonprofit organization operated by a board of directors comprised of parents, faculty, and staff for the benefit of our school. We receive our funds from individual donors and businesses who receive a tax benefit for their donation. The foundation was formed in 2010 by parents and the administration to supplement educational expenses that were no longer being covered by Cobb County Schools in order to keep our children’s education competitive in all areas of learning. Our mission is to raise money for the school that will allow our school’s administration to fund elements of and/or enrich curriculum programs and student services. Meet our 2018-2019 Board of Directors! 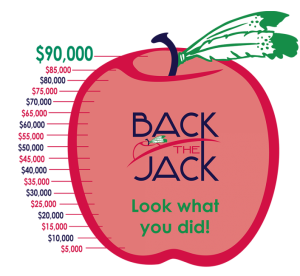 The past six academic years, through our Back the Jack Campaign, we have raised between $50,000 and $85,000 each year. Each year at the completion of the campaign, the foundation works with the administration and teachers to determine to which curriculum and technology programs/areas the funds should be directed. Some of the programs we have funded in the past include: iPad mini carts, BrainPop, Ed Helper, Renaissance Learning, Tumble Books, MyOn Reader, Lucy Calkins Units of Study Writing Programs, and other helpful curriculum items. We have also been able to fund our teacher grant program each of the last six years. If you would like to help raise money for our programs, please donate to the foundation and volunteer for any of our upcoming events. The Nickajack Elementary Foundation is a 501(c)3 organization and is committed to providing our children with a competitive, twenty-first century education. Your donations are tax deductible. For questions, please email the foundation president.